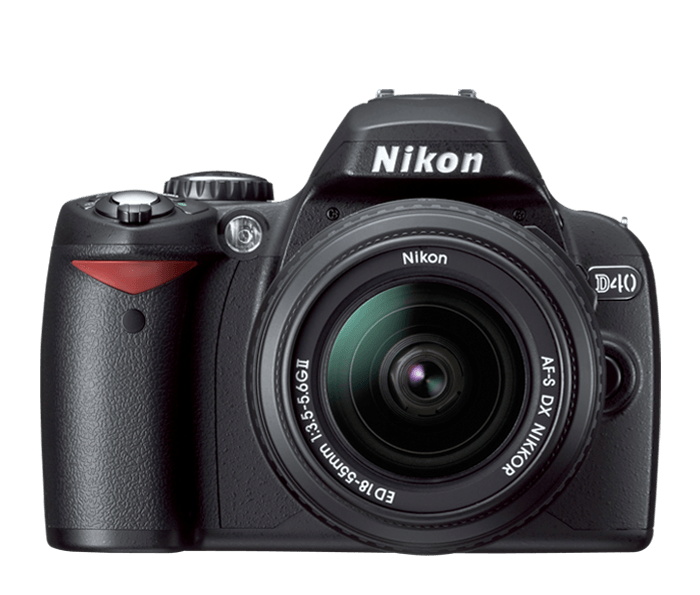 Extraordinary Nikon image quality: The D40's high-resolution image quality is made possible by Nikon's high-performance 6.1-megapixel Nikon DX-format CCD imaging sensor and exclusive Nikon image processing engine which assures stunning sharpness and colour. 2.5-inch colour LCD monitor with 3 colourful display options: Playback images are easy to see and function menus are easier to use with a larger and brighter colour LCD monitor. The large 2.5-inch LCD monitor enables image preview at up to 19 times magnification and has large type fonts and easy-to-view menus as well as three all-new display options: classic, graphic and wallpaper. High-performance 6.1-megapixel Nikon DX format CCD imaging sensor: Nikon's DX-format CCD image sensor delivers vivid colour and sharp detail, great for making beautifully detailed enlargements of 16 x 20 inches and beyond. High resolution also provides room for creative cropping. In-camera image editing: Highly versatile in-camera editing features include: Nikon D-lighting, red-eye correction, image trimming, image overlay, monochrome black and white, sepia and cyanotype along with skylight, warm tone and custom colour filter effects. These features provide greater creative freedom, without the need for a computer, for those who prefer to send pictures directly to a printer. Image optimization options: The D40's image optimize setting lets photographers adjust colour, contrast and sharpening as well as other image settings according to the type of scene or output desired. Settings include: normal, softer, vivid, more vivid, portrait, custom and black and white, each of which are automatically adjusted based on sophisticated Nikon algorithms or user-selected settings for optimum results. Nikon 3D Colour Matrix Metering II: The D40's 3D Colour Matrix Metering II evaluates each scene for brightness, colour, contrast, size and position of shadows and highlights, selected focus area and camera-to-subject distance, comparing that information against an onboard database of more than 30,000 actual photographic scenes.